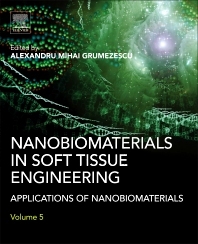 Nanobiomaterials in Soft Tissue Engineering brings together recent developments and the latest approaches in the field of soft tissue engineering at the nanoscale, offering a new perspective on the evolution of current and future applications. Leading researchers from around the world present the latest research and share new insights. This book covers the major conventional and unconventional fabrication methods of typical three-dimensional scaffolds used in regenerative medicine. Surface modification and spatial properties are included in an up-to-date overview, with the latest in vivo applications of engineered 3D scaffolds discussed. The book also considers the impact, advantages and future scope of the various methods. An informative handbook for researchers, practitioners and students working in biomedical, biotechnological and engineering fields. A detailed and invaluable overview of soft tissue engineering, including the most recent scientific developments. Proposes novel opportunities and ideas for developing or improving technologies in nanomedicine and nanobiology. Academic: Materials science, biotechnology and applied chemistry professors, PhD, MsC, postdocs, upper level undergraduate students. Industry: Pharmaceutics and biotechnology companies, medical researchers, biomedical engineers, advanced clinicians.